Last month, heavy rainstorms in California brought to the forefront the issue of what is a “flood” under California law, particularly in regard to rain and surface water. 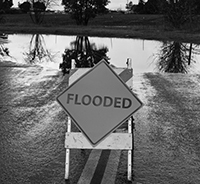 We noted a California court held “flood” in its plain meaning encompasses water from a “flash flood,” defined as a “local flood of great volume in short duration generally resulting from heavy rainfall in the immediate vicinity.” Horvath v. State Farm, No. G048457, 2014 Cal. App. Unpub. Lexis 4706 (Ct. App. June 30, 2014). In rejecting the policyholders’ argument that flood cannot be caused simply by excess rainfall, but only by an existing body of water exceeding its bounds, the court stated simply, “That would be news to Noah.” Id., (citing Genesis 7:17). The issue frequently arises when heavy rains overwhelm the capacity of a water collection system or cause damage to water containment structures. Decisions from courts on the East Coast are illustrative on the application of the flood exclusion to damage resulting from heavy rains and in particular, when water becomes “surface water,” triggering the exclusion. In Florida, where torrential rainstorms have caused flooding problems in the panhandle this year, a court recently held that rain water that pools on adjacent property and then overflows on to the policy holder’s property is “surface water” within the flood exclusion. Intrepid Ins. Co. v. Prestige Imps., Inc., 78 So. 3d 583, 584 (Fla. Dist. Ct. App. 3d Dist. 2011). The insured car dealer in Intrepid Insurance Company v. Prestige Imports sustained damage to its used car inventory when heavy rains caused water to collect on an adjacent property and eventually overflow onto the car lot. The water overflowed because the storm water drainage system on the adjacent property was overwhelmed. A Florida appeal court determined that whether the exclusion precludes coverage depends on the cause of the inundation. The court determined that if, as the insurer asserted, falling rain water pooled on the adjacent property and then flowed into the car lot, the water was “surface water” and the flood exclusion precludes coverage. If, on the other hand, the water flowed from the storm drain, it was not “surface water” and the flood exclusion would not apply. The ruling is generally consistent with other courts around the country that have held if the rain water flow was due to overwhelming the rain collection system, it is “surface water” and damage is excluded. If, however, the rain water at one time was in the storm collection system but then flowed from the storm collection system, the water damage was not caused by excluded surface water. In M & M Corp., the state department of transportation was in the process of constructing a new underground storm water drainage system when heavy rains fell across the area. Because the drainage system was incomplete, 830,000 gallons of collected rain water that had been collected in 1600 feet of pipe escaped and flowed onto the adjacent hotel parking lot owned by the insured. The water first pooled in the lot and eventually flowed into the hotel and caused significant interior water damage. The insured’s claim was denied based on the flood exclusion. The court held that, because the rain water was intentionally collected, it was not cast upon the hotel property fortuitously and was therefore not excluded surface water. The conclusion led to the second issue of whether the water became surface water once it escaped from the drainage system. The court determined that, because the water only reached the hotel when it was deliberately collected, it did not regain its classification as surface water when it was expelled from the unfinished pipe.